Go with the flow at these cozy cabins by the water. The temps are falling, the mountains are turning gold, the trout are running, the crowds have ebbed. There’s no better time to rent a cabin near one of New Mexico’s many luminous rivers. Here are five choices that will whet your appetite. The Texas Tipi is proof positive that cabins come in Large—this three-story, 2500-square-foot A-frame can sleep up to 12. Plan to stay a while if you want to take advantage of everything the property has to offer. Walk out the back door to fish for trout just feet from the house, or linger in a hammock by the river and nap in the shade. Opportunities for hiking, rafting, and horseback riding are close by, and for indoor fun, the cabin comes equipped with board games and movies (including, according to one happy visitor, a large selection of James Bond flicks). The Tipi has 2 master bedrooms and a loft that sleeps 6; 3 full baths. Available year-round. (575) 779-3655;(www.homeaway.com/vacation-rental/p275435). From $264 per night. Casa de Luz is what every cabin wants to be when it grows up. This contemporary home, a literal stone’s throw from the Jémez River, has 28-foot high, floor-to-ceiling windows in the great room that provide cliff views that will steal your heart. The house manager is also a fly-fishing guide who offers discounts to guests. If you’re a climber, take your gear to Las Conchas, just north of Jémez Springs, and enjoy challenging bolted routes graded from 5.6 up to 5.13c. Then soak your tired muscles at one of several natural hot springs in the Jémez valley. 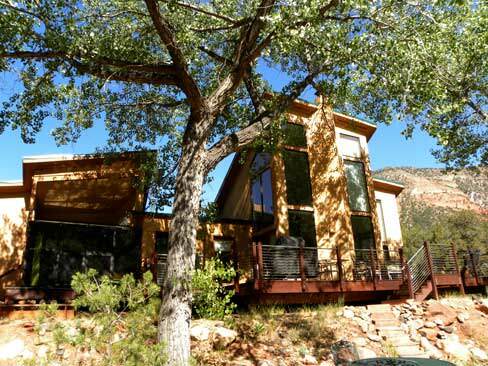 Plan to spend the rest of your time relaxing on the wraparound deck in the fresh mountain air. In the evening, watch the sun sink behind pastel cliffs from the Casa de Luz patio, and enjoy your dinner alfresco before falling asleep to the music of the river. This 2-bedroom, 2-bath house sleeps 4–5, depending on the season. Available year-round. (505) 934-3372; (www.nmriverfronthome.com). From $300 per night. Craving a wildlife connection? This new Los Brazos cabin sits within a designated wildlife refuge where mule deer are so plentiful and tame they’ll eat out of your hand. Keep an eye out for elk, wild turkeys, and maybe even bears. The cooling waters of the Brazos and Chama rivers are a short drive away for fishing and wading fun, or launch a kayak at nearby Heron or El Vado lake. Catch the Cumbres & Toltec Scenic Railroad (trains depart daily from nearby Chama). After venturing out, kick back at the cabin with dinner and a Roku-streamed movie. This 3-bedroom, 2-bath cabin sleeps 6–7. Available year-round. (970) 398-0176;(www.vrbo.com/270047). From $130 per night. Take a step back in time when you stay at this romantic, century-old log cabin in Pecos Canyon. Built by a fishing guide around 1900, the cabin sits on 1.3 acres sheltered by cottonwoods on the banks of the Pecos River. If you love to fly-fish, you’ll enjoy having rights to 360 feet of stocked river bursting with rainbow, brown, and cutthroat trout. This 1-bedroom cabin comes complete with everything you need to make your river retreat memorable, from the fully equipped kitchen to the luxury linens and soaking tub in the upstairs bath. The perfect place to reconnect with your favorite person . . . and nature. This 1-bedroom, 1-bath cabin with sofa bed sleeps 4. Available year-round. (520) 940-0424;(www.pecosrivercabin.com). From $159 per night. “I think what makes us special is that families can stay here with their dogs,” says Michelle Kaip, owner of Lazy Dog Lodge, in Ruidoso, where canine family members are treated as guests. A fenced side yard provides a safe place for dogs to play when not exploring the river or hiking trails with you. There’s also plenty for humans to do at the Lazy Dog. Rent mountain bikes, or just while away the days watching wildlife from the porch. After the sun goes down, step out for the evening and mingle with the locals at Win, Place or Show, an authentic honky-tonk with live music 365 nights a year. This 3-bedroom, 2-bath cabin sleeps 6–8. Well-behaved dogs are welcome. Available year-round. (915) 474-0554 or (915) 474-0555; (www.lazylodges.com). From $150 per night. Ana N. June is a writer, graphic designer, and photographer who has been exploring New Mexico since 1977.